Q: Are there any natural treatments for uterine fibroid? I have been diagnosed with fibroids the approximate size of a five-month pregnancy. Are there any options other than myomectomy or hysterectomy, such as the uterine artery embolization procedure? My husband and I would like to have a family in the future. A: I have not found any natural therapy to be consistently reliable in shrinking uterine fibroids. Although natural therapies have proven effective in managing heavy or irregular bleeding, pelvic pain, back pain and other gynecological problems, it is rare for them to effectively shrink fibroids. Since your uterine fibroids are quite large, some sort of surgical intervention is probably advisable. Several surgical options are worth considering other than a hysterectomy. 1) Myomectomy – Myomectomy does involve abdominal surgery (only the fibroids are removed) and takes about six weeks to heal, but you retain your uterus and your fertility. 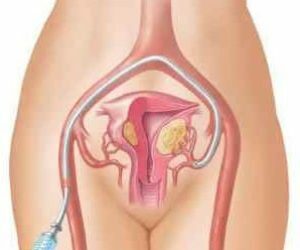 2) Hysteroscopic Surgery – When a uterine fibroid is bulging into the uterus, it can be removed by using a hysteroscope. 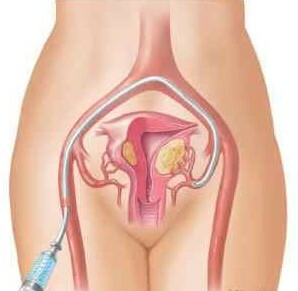 This is a small telescope inserted through the cervix and into the uterus. The uterine fibroid is shaved away using instruments inserted through the hysteroscope. Doctors can also use this procedure to direct lasers or electric currents to shrink larger growths. 3) Laparoscopic Surgery – This procedure is not really appropriate for uterine fibroids larger than a four-month old fetus. Also, it is intended specifically for uterine fibroids on the outside of the uterus. The laparoscope – a thin, hollow, periscope-like tube – is inserted through a small incision in the abdomen through the scope. A doctor can either vaporize the tumor with an electric current or surgically remove it. 4) Uterine Artery Embolization – Embolization is a new technique pioneered at University of California at Los Angeles, in which the blood supply and blood vessel to a uterine fibroid is permanently sealed off. Without its blood supply a uterine fibroid will shrink up to 65%. Since it is a fairly new procedure, you may need to do some homework to find out which gynecologists in your area have been trained. The hospital at a medical school or a teaching hospital are good places to look. Find a doctor who is willing to educate you about the pros and cons of all the options, is trained in the procedures and will respect your educated choices.